What do Santa Claus, Wenceslaus I of Bohemia, Saint Luke the Evangelist and the oldest microbrewery in Houston have in common? Well, the title gives the game away, but assuming that you didn’t read that, or you’ve already forgotten it, the answer is…”Patron Saints of Brewing”. I say “saints” because the more I looked, the more I found. I’d thought there was only one, Saint Arnold, after whom the Houston brewery was named, (though it turns out there are two Arnolds, one from Soisson, one from Metz). They sprang up from everywhere and everywhen, until it seemed that every country and time had its own saints, gods or goddesses who looked after beer, brewers or associated trades. I was further delighted to discover that there are also those who (allegedly) intervene in matters of alcoholism and hangovers, so these holy folk are looking after the drinker coming and going. Which is nice, I feel. Anyway, let’s have a little flesh on these old bones, shall we? There are actually two Saints Arnold who are patrons of beer or brewing. First up is a chap from Belgium, a former soldier who joined the monastery at Saint Medard’s Abbey in Soisson, where he rose to be abbot. While there, we began to brew beer, which he promoted as a drink healthier than the local water, and encouraged the drinking of it for all – monks, peasantry and everyone. Given the nature of the polluted water supply, this was a Good Thing, and he was, of course, correct. The process of brewing involves boiling water, fermenting barley and adding hops; all these things produced a drink that was both sterile and nutritious. In recognition of this interest in ale, he is now recognised as the patron of hop-pickers and brewers. The next holy fellow is Arnold of Metz (aka Arnulf), who entered the priesthood as a young man and was appointed Bishopp of Metz at the age of 32, in 612 AD. Here things get muddy, because many of the things Arnold of Soisson did are also attributed to him. He brewed beer, warned of the dangers of drinking polluted water and so on. Saint Arnold was acclaimed bishop of Metz, France, in 612 and spent his holy life warning peasants about the dangers of drinking water. Beer, he said, was safer than water, and a gift of God. “From man’s sweat and God’s love, beer came into the world”, he’d say. in 627 he retired to a monastery at Remiremont in France, where he died on August 16, 640. After his death, the citizens of Metz requested that his body be exhumed and reburied in Metz itself. As the procession passed through Champignuelles, they paused for refreshment at a local inn, only to discover to their understandable dismay that there was but one mug of beer left. Determined to share their reward, they passed it around, to discover that no matter how much they drank, the mug never emptied. This miracle was taken as a sign that Arnold was, indeed a saint, and he was canonised. Stout chap, he’s still the patron of hop-pickers and brewers. There’s a veritable communion of beer-loving saints. Wikipedia lists several, including Saint Amand (brewers), Augustine of Hippo (brewers) and Dorothea of Caesarea (brewers). Further research revealed even more, including St Gambrius, Saint Luke the Evangelist, Saint Nicholas (aka Santa Claus), Wenceslas (the Good King of the Christmas carol) and Saint Brigid of Ireland. It’s hard to say how some of them came to be associated with the miracle that is beer, and in some cases, I frankly gave up trying. I’m a poor scholar sometimes, I admit. Saint Amand was a missionary bishop who preached in France and Belgium, founding monasteries in Belgium, which was then (as now) noted for producing beer. This association with beer-making regions is presumably why he’s associated with brewers and wine-makers to this day. Saint Augustine has no association with Belgium – he was born in North Africa and spent some time in Rome before converting to Catholicism and eventually returning to Africa to live a hermit’s life. How he came to be a patron of beer is a mystery to me at this point, and as I’m in for an easy life, I apolgise for not pursuing Augustine. Now Dorothea came to be the patron of brewers, brides, florists and midwives, among other things. She was a 4th century martyr who refused to marry, took an oath of chastity and refused to venerate idols. As she was being prepared for her execution, a young man named Theophilus mocked her and challenged her to bring him fruits and flowers. At this, a young child appeared with a basket of fruit and flowers, which was presented to him, at which point, he too was converted, and shared her fate as a martyr. Now I can see how she’d become the patron saint of florists, but I can’t yet find a beer connection, unless it be via hops, they being the flower cones of the hop plant. Odd, this patronage thing. Gambrinus, on the other hand, is better connected with the art and science of brewing. 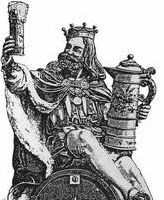 Various attempts have been made to connect his name to brewing terms – possible etymologies include cambarus, meaning cellarer) and ganeae birrinus (a frequenter of inns). According to Wikipedia, the name “might also derive from camba, a word from the Celtic language family that refers to a brewer’s pan”. Whatever the meaning of his name, he was a legendary king of Flanders (Belgium again! ), but other tales place him as an English knight. It’s alleged that he learned the art of brewing from Isis, the Egyptian goddess. Now we move to more familiar territory, Saint Luke, Saint Nicholas and Wenceslas. Again, it’s hard to say why these people should be closely associated with our beloved brew, especially Saint Luke, although as a physician, he may have understood the health-giving aspect of beer. Saint Nick and King Wenceslas are maybe easier for us to picture as patrons of the jolly-making aspects of beer. Nicholas was the bishop of Myra, in Turkey, and was said to be a generous supporter of the poor, and legend has it that he raised to life three boys murdered by a local Sweeney Todd of a butcher, who was pickling their bodies in a barrel of brine. He’s associated with the Legend of the Three Clerics, who were murdered whilst at a tavern. Nicholas resurrected them, which explains his patronage of travellers and innkeepers (possibly out of referred guilt on their part). As he is also known as a patron saint of coopers, the barrel-to-beer connection again possibly explains his patronage. Wenceslas, a real-life duke of Bohemia has the tale told of him that he took bread and wine (possibly beer?) to a starving peasant. The song song in his honour at Christmas speaks of his generosity and concern for fellow man. Another bringer of joy to the poor. Now we come to Saint Bridget , possibly my favourite of all the patrons of ale. Also known as Bride, Brigit and others, according to legend she was born in County Louth in Ireland. 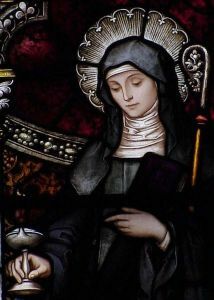 Tales of her life are many and varied, and she may in fact be a made-up Christian version of the pagan goddess Brigid, “a woman of healing…and smith’s work”. However that works, she’s also a patron of poets, brewers and blacksmiths. Given the nature of blacksmithing, I imagine them quaffing a mug of ale and giving thanks to her, which again, may explain that connection. Further to that, she was a beer-lover. Whilst working at a leper colony, she miraculously changed bathwater into beer, and served it. In fact, this tale is repeated again when she changed her dirty bathwater into beer for visiting priests. That she loved the saintly brew is also shown in a poem attributed to her: “I should like a great lake of ale, for the King of the Kings. I should like the family of Heaven to be drinking it through time eternal.” Quite a gal to have around if you were a beer-lover. There are doubtless countless more, including old gods of Egypt (Isis included), but I need a beer now, so I’ll leave you with this last message. If you’re still in any doubt about the holy quality of your brew, take a peek at How to Bless Beer. I did a lot of reading on this topic, and used a good number of online resources, containing far more than I could reasonably write about here. For more, visit BeerHistory and the excellent resource at saints.sqpn.com.